Good thing we like cucumbers. We are picking them everyday. Five picked today. The little 2″ diameter tomatoes are “stupice”. They produced the first tomatoes of the season, a month ahead of my usual tomatoes. Yes, eventually we will have too many cucumbers. Soon I will make refrigerator pickles and keep a bowl of cucumbers and onion slices in herb vinegar all the time while we have them. There are two more kinds of cukes I am growing this year. One is the little Kerby-type, which got planted late. 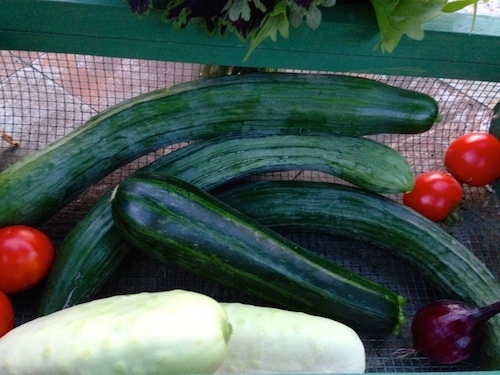 My all-time favorites, an English cucumber, which I am just wondering about and will go looking for tomorrow. Eventually, I’ll can a few garlicy dill sandwich slices and peppery spears. 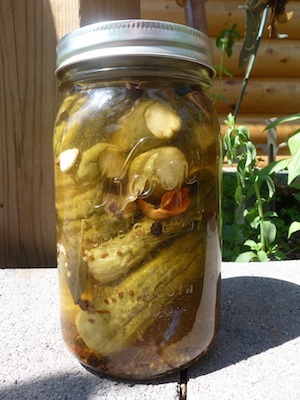 Plus, if I could only make one pickle, it would be the famous bread and butter pickle. 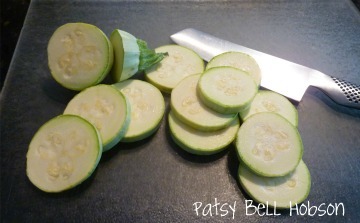 Uncle Ebb got a few white cucumbers on a sales trip, he shared them with his mom, my grandmother. She grew the white cukes and saved seed for some years. White wonder are very crisp. don’t let them get big because they get bitter and need to be peeled. 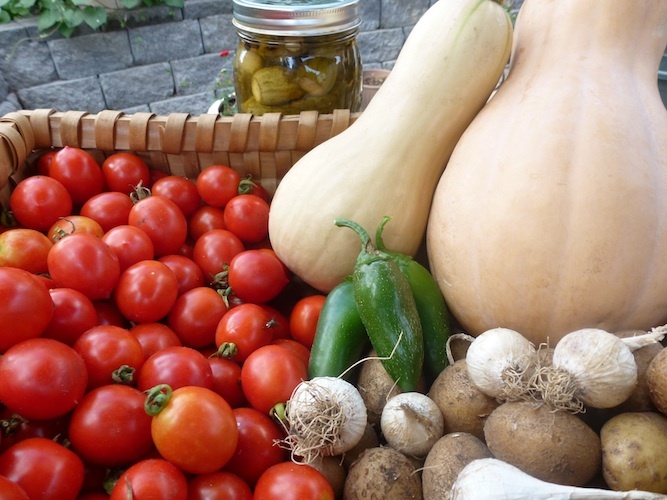 Nichols Garden Nursery offers seed for white wonder cucumbers and stupice tomatoes. A packet of 25 White Wonder seed from Burpee is $3.95. Nichols offers White Wonder cucumber seed about 45 Seeds for $1.85. Stupice heirloom tomato will be your first tomato of the year. Bred in the former Czechoslovakia, stupice is lunchbox size. 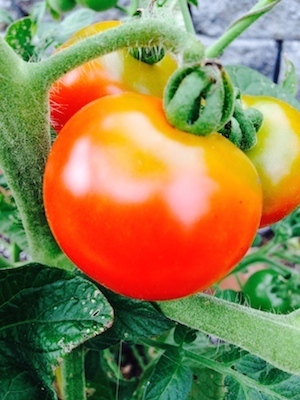 Cold-tolerant tomatoes ripen red slightly oval. They get better and sweeter as the weather gets warmer. That big butternut squash weighs over 3 pounds. I did not count the Riesentraube cherry tomatoes, but just one tomato plant produced all of these. They filled a 2.5 quart bucket. Riesentraube means “Giant Bunches of Grapes.” Plant them once – you will always have these little German heirloom cherry tomatoes in your garden. Jere Gettle of Baker Creek Heirloom Seed is giving out free Riesentraube with some seed purchases. I suspect Gere is trying to cover the world with little pointy tomatoes. They are prolific. Riesentraube is an early producer. When the big tomatoes start producing, I start drying these little cherries. Here is how I use these hundreds of cherry tomatoes: Tomato triage for too many tomatoes. While I was cleaning out a raised bed, I found two pounds of these little potatoes. I did not plant potatoes this year. They came up from spuds I missed last fall! TAM, a very tasty milder Jalapeno, just keeps producing.Kepp watering this pepper and it keeps producing as long as you keep picking peppers. I left this jar of sun pickles out on the retaining wall for another day or two. When I made these, it clouded up and rained for three days. Which was good for the garden. But who knows about sun pickles? Tatume – a Mexican variety favored in Texas, Raven – a traditional variety, and Clarimore, a Mediterranean squash. So when Jules came home from work, he asked what’s for supper. “zucchini casserole and zucchini slaw with pickled zucchini!” I said. But we had toasted zucchini bread for breakfast, Jules whined. “with zucchini jam!,” I reminded him. Well, what’s for desert? he said. I was thinking that if I sounded excited about it (hence the exclamation marks) he would be excited about eating our fresh from the garden bounty. Tomorrow, let’s go out to dinner, he said. This is the first year I can remember having too much zucchini. Usually the squash bugs and squash vine borers attack the plants well before the zucchini get into peak production. Clairimore is a Mediterranean squash, a nutty flavorful variety with pale green skin. We have a house rule, if it’s too big for one person to carry into the kitchen, just roll it over to the compost pile. Does Ripley’s Believe it or Not! have a zucchini record? If so, I think I have a contender. Here are some real suggestions on how to manage your harvest. Local Cook suggests “Hide it in desserts, such as Zucchini Brownies. Chocolate, like cheese, makes everything taste better! This brownie looks good enough to eat. My bountiful harvest is from seed I got at Renee’s Garden. She just posted Zucchini pancakes recipe AND a photo contest. Posted in My Gardens, My Homeplace, Oh Grow Up! Save some seed for planting and use some for healthy snacks. An easy seed to save, and you’ve got time. Most winter squashes will keep for months. 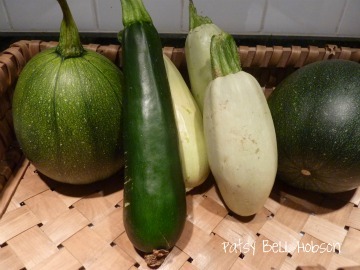 When you do get around to eating these hardy winters wariors, save some seed before you cook the squash. Rinse the seed, let then dry, flat and in a single layer between a paper towels. Scoop the pulp and seeds from inside the pumpkin. Seperate the stringy pulp from the seeds. Compost the pulpy core. Rinse the seeds. Bring 4 cups of water with a Tablespoon of salt to boil. Add seeds. Reduce heat and simmer for about 10 minutes. Strain seeds and spread out in a single layer to dry on cotton towels or paper towels. Skip this step if you do not want salted seeds. Heat oven to 375. Spray pan with any good vegetable oil. Spread seeds onto cookie sheet in a single layer. Spay lightly with oil. If you want spicy seeds, add seasoning now. Bake on the top rack until the seeds begin to brown (about 15 to 20 minutes). If you would like seededs darker, put back in oven, checking often until they are as brown as you like. Watch carefully, the time between browned and burned is but an instant. Remove the tray of pumpkin seed and cool on an a rack. Let the seeds completely cool. Eat the seeds whole. If you have all the time in the world, crack open the pumpkin seeds and eat only the inner seed. I like te eat the whole seed. Chop and use as garnish in soups and other dishes that could use a little crunch. Store in an air tight zipper bag in the frig. If you do have any left over, roasted or raw seeds, share them with the birds. 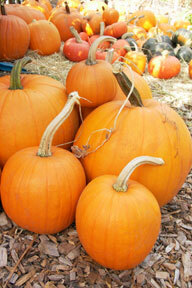 20% off on ALL pumpkin seed ar Renee’s Garden. Most seed companies have reduced prices to tempt you into buying more seeds about this time every year. It is a good time to see where you can fill the empty spaces in your garden and try some succession planting to keep your garden growing until late fall. These are a few of the seed companies that caught my eye. Renee’s Garden Seeds says, “Planting season is here, and we’re offering a Spring Fling Discount of 15% off your next order. Enter DSC410 in the “coupon code” box on the checkout page. Good on or before May 2, 2010. Shop for seed to grow cool season crops. Compacts pants are a good choice for containers. Gurney Seed and Nursery Co is having a clearance sale. They have a Special Offer: Save $20.00 When You Buy Product Totaling $40.00 or More. Limit One Offer Per Customer. I bought a couple of thornless blackberry vines. I’ve always had good luck ordering asparagus and fruit trees from Gurney’s. Johnny’s Selected Seed, “Take 20% off selected varieties (below) while they last. Use offer code 10-1070 when checking out to get your discount.” They are offering Yukon Gold, Dark Red Norland, Red Gold and Superior. All good home garden choices. Also take advantage of the bumper seed crop with reduced prices on select seed varieties. Seeds of Change will give you 10% off everything when you become a fan on Facebook. Use offer code: FACEBOOK at checkout. Even Home Depot has Buy-One-Get-One seed packets right now. Squash are heavy producers. Plant only a few of each kind. Most all the spring crops are in the ground. If yours are not, you still have time for salads and spring greens. Now is a good time to look over your remaining seed and plan for the space that will be available as you harvest spring crops. The No Longer Secret Garden. Early this year I announced my bale garden project. The advice of garden expert Rose Marie Nichols McGee has some great advice about bale culture. The Gardeners Pantry Blog is the best straw bale information you can get. Plus there are some very good recipes. We both got busy with the many things that gardeners do. I neglected the blog entries I had promised because the bale garden was failing and I was away from the garden all of June. At first, the seeds I sowed in the soil atop the bales flourished in the spring. It looked like I would have a guaranteed success. The neighbor was where no where in site. As the seedling roots reached deeper into the bail, they died or just stopped growing. I was not going to take a picture of this sad failure until I had an answer as to why the lettuce seeds were dieing. I continued to plant beans, cucumbers and summer and winter squash seed on top of the bales. There were no signs of insects on the plants. The seeds that were sprouting then struggling to survive. The neighbor planted to matoes. At first, I thought it was a fun and friendly competition because I always win. Not this year. I planted tomatoes in the bales when the weather got warm enough. The tomato plants did not grow. The neighbor, who had red ripe tomatoes in his garden a full month before my garden, was down right joyful at his success. His success was a bellwether for my garden. Most insulting of all, he kept offering me tomatoes from his garden. “I’ve got plenty of ’em,” he said. Then, the natural baling ties began to fall apart. If I had bales with synthetic twine, the bales may have lasted for two seasons. The tomato plants were simply not growing. I finally figured out that the straw had been treated or sprayed with some herbicide. After the seeds got past the top soil on the bales, they started to die very quickly. Even weeds would not grow on the bales. I abandoned the project, not mentioning it at all in this blog. The tomato plants were just not growing in the bales. A few shallow rooted chard plants grew on top of the bales. In July, the heirloom tomato plants began to grow. And one winter squash plant began growing fast and blooming like crazy. By August, early blight hit all the tomato plants in the garden, and in the bales. In September, the tomato plants and the lone delicata squash are producing. That is the bale garden at the top of this blog. Because the surviving plants have been struggling all year they are weak and more susceptible to disease. A couple of the tomato plants on the bales aren’t even producing at all. Bugs are eating up the few remaining bean plants on the bales, and the squash bugs are in need of some serious crowd control. Of the several marigolds that I planted surrounding the bales, only two of the marigolds lived. They are growing at about the same rate as the other marigolds around my other gardens. Nothing will slow down the growth of those hardy marigolds until frost. Finally, I am now getting some good sized tomatoes from the bales. The success will be short lived because of the blight. The bales are slowly imploding, collapsing in on themselves. The story of the bale garden ain’t pretty. Not all gardening projects go as planned. I’m not baling out. The project was enough of a success that I am going to learn from my mistakes and try again next year. The short, frustrating story of gardening on bales ended by growing with some of my biggest tomatoes of the year.